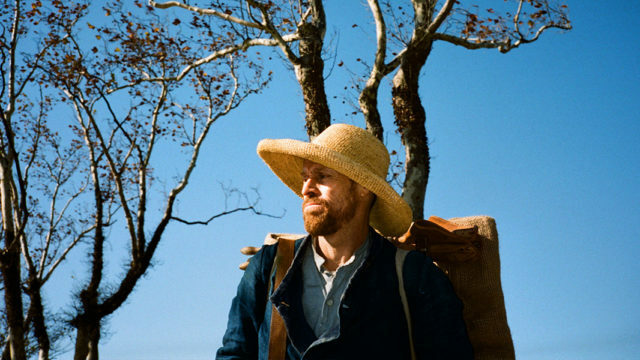 Julian Schnabel's AT ETERNITY'S GATE was hands down my favorite film at the New York Film Festival. A film that uses the life of Vincent van Gogh to ruminate on painting, art, creativity and the need to express one's self at all costs. It left me sobbing and unable to speak at it's conclusion. Sitting in the darkness as the end credits rolled I prayed no one would ask me what I thought lest my voice crack and I start uncontrollably crying. Hubert did ask me near the end and I simply croaked "My favorite of the fest"
Not a biography but an descent into a headspace the film puts us visually and aurally into the head of van Gogh. This means what we see and experience is what he does. There is nothing outside of it so we are not given details unless it is something he sees or thinks. It is a film where the whole point is to get you to see the world through his eyes and ears, not to give us history. This is Vincent living life and battling with what he feels and how he experiences life and art. Frankly this is a film you have to work with. If you go in expecting a straight forward narrative you will be disappointed. While it moves through time it doesn't even try to tell Vincent's physical life. It is his internal one. The dialog is not so much dialog but statements of position about art and life and the questioning of it as van Gogh tells us what he thinks of the world and everyone, except his brother Theo, challenges his notions. This is a film that tries to explain what it is like have the burning desire to create at all costs. It is something that van Gogh is forced to explain to everyone-all of whom, Theo and Gauguin excepted, fail to understand. If you've ever felt the need to create when there is so much else you should be doing, or if you find that your only happiness is when you are making "art" then you will connect to the film, if not you maybe lost. Most of the film is visual or impressionistic. Vincent's view is often hazy, the bottom of the screen often out of focus. Colors are heightened in places and we are made to feel joy and pain through image and sound. Yes we are seeing events but framed in such away to make us feel. Schnabel's images moved me to literally the point of tears as I could feel what Vincent was feeling thanks to the perfect casting and perfect performance of Willem Dafoe as van Gogh. Dafoe has it all written on his face and in hie eyes and it crushed me. Everything in this film overwhelmed me because it perfectly expressed what I feel about what I create. To me this film is one of the greatest expressions about creation I've ever seen. This is what I feel when I write or draw or make a film. And I know most people won't see it that way. In away it is like tying to experience what it is like to be someone else without actually being in that persons body. Not everyone can make that connection because they are simply not wired that way. Some people can not make the connection fully because Schnabel's film trip the "sensors" that would allow the connection- their vocabulary isn't the same sort of like if a cat tried to explain to us what it is like being a cat. I spoke with a couple of people about the film and they could intellectually understand what the film was but they couldn't connect emotionally. For the film to work you have to realize tha is a film that requires you to give yourself over to it and let it do what it wants to do. It is a film that is not truly intellectual but emotional. Art like van Gogh's isn't something you intellectualize but something you feel. It's the reason why I cry every time I see Starry Night in person, it, like AT ETERNITY'S GATE speaks to me somewhere beyond words. It is a film that doesn't act and behave like a normal film. It is not something you can think about and try to piece together- rather it is one that has to wash over you and claw into your heart. It is a work that has to be felt and experienced for what it is. You can't think about it you have to live it. Frankly I can completely understand why some people don't like it, or like it in pieces or are confused by it. Intellectually I see all the problems- but emotionally I don't. Emotionally I feel it deeply, even the imperfections which simply add to it's beauty. To me AT ETERNITY'S GATE is a cinematic masterpiece and a piece of high art. I feel it in ways that I feel few films. I do not expect you to like it or get it, not everyone gets van Gogh's work either. That's fine. For me it is something special, something I will treasure forever, which right now is enough.